I’m one of those people that waits to do laundry until they absolutely have to. It’s not so much the putting in the machine and the dryer that bothers me, it’s the actual putting things away after that is annoying. There are things that hang and things that go in drawers. It’s just so detailed. Part of my issue is that my closet was overflowing. Horribly. I was running out of hangers for things and things were all squished together. My scarves were taking up three hangers of space in my closet (I do love my scarves). It was just bad. So I’m begrudgingly putting away a load of laundry yesterday and I’m thinking, “I have GOT to clean out some of this stuff in here…what is this? Did I ever wear it?” So I decided that when I was finally done all of my laundry, I’d clean the stuff out of my closet. 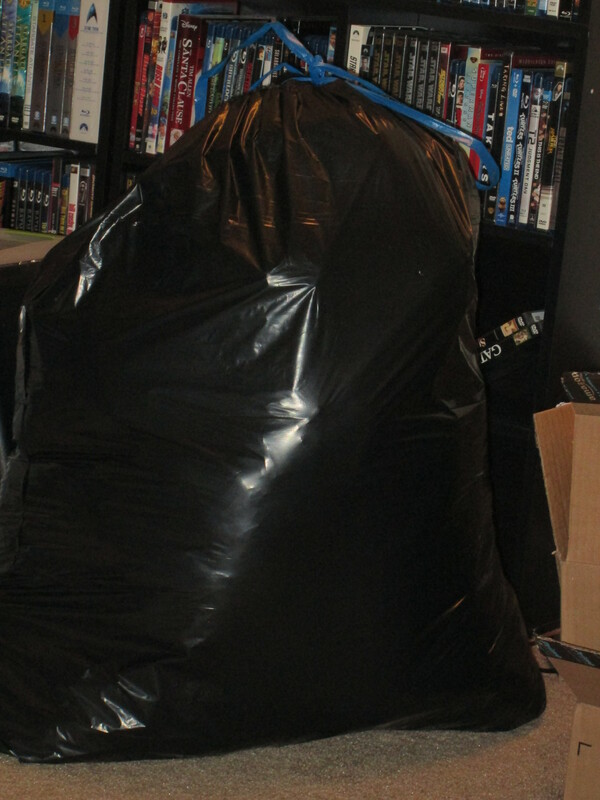 This entire trash bag right here is filled with clothes and even a few scarves (don’t faint, I still have about 30 more to make up for it). That’s a 33 gallon trash bag, btw. It’s bad. It was so bad. But I actually have room again. And of course my first thought, being female, is yay buy new stuffs!!! I mean I have to replace the stuff I’m getting rid of, right? Right?